Pastors work in a complex relationship network. New research shows that efforts to improve clergy health must go beyond eating well and exercise to account for the influence of congregations and denominational polity. Editor’s note: To learn more about the Duke Clergy Health Initiative, please visit its website. Pastors work within a complex web of relationships -- peer, family, congregation and denomination among them -- with sometimes-conflicting demands that have repercussions for pastors’ vocation and health. In that web, new research shows, the influence of congregations and the denominational polity is so strong that pastors’ efforts to be healthy are likely to be enhanced -- or thwarted -- by the institutions in which they serve. This analysis of conversations with 88 United Methodist pastors and district superintendents, published in April in the Journal of Religion and Health, is the first to examine how to tailor health interventions to clergy. The findings make clear that programs to improve clergy health will succeed only if they address the multiple conditions that contribute to health, especially conditions created by congregations and denominational polities. Concern for the health and wellness of Christian pastors, especially in mainline denominations, has been rising for a number of years. The problem has not been obvious to lay members in the pews, but it has not escaped notice of denominational leaders and researchers. Several church bodies began pastoral wellness programs in the 1980s and 1990s, but later studies showed these programs had not solved the problem. A 2001 Pulpit & Pew research project revealed strikingly high rates of obesity in a nationwide survey of parish pastors. Dr. Gwen Halaas’s 2002 study of ministerial wellness in the Evangelical Lutheran Church in America described significant levels of stress, depression, and lifestyle-related physical ailments in ELCA pastors who, in her words, faced greater demands and less support than their predecessors. The Church Benefits Association’s 2006 study of clergy in 10 Protestant denominations showed that clergy report more job demands, criticism and stress from criticism than do laity. All of these factors contribute to rising health care costs, challenges retaining clergy, and decreased passion and effectiveness among the clergy who remain. The Duke Clergy Health Initiative, funded by the Rural Church Division of The Duke Endowment, conducted a series of focus groups across North Carolina, with eight focus groups involving congregational pastors and three involving district superintendents. In all, 88 pastors and leaders participated and revealed several dozen factors that influence clergy health, which are listed here. This list offers a new and hopeful picture that lasting wellness can be achieved among clergy in the U.S.
Pastors, who define health comprehensively as a physical, mental and spiritual phenomenon, were highly attuned to the responsibility they have for their own health, and were quick to note in the focus groups their own shortcomings in such behaviors as regular exercise and healthful eating. However, they also indicated that congregant expectations that pastors be available 24/7 contribute to the challenge of being healthy. Pastors reported that some churches create stress for the pastor due to congregational conflict and unhealthy church dynamics. Pastors said situations in which one or more congregants use intimidation or abusive tactics to oppose the pastor are particularly harmful. Pastors also talked about the United Methodist Church’s leadership structure, in which bishops oversee district superintendents who, in turn, supervise pastors. Those district superintendents, pastors said, can support their health by asking about their self-care and encouraging the practice of setting aside personal time. By their own description, though, district superintendents don’t universally practice that level of supervision. Pastors reported looking to district superintendents, as conveyers of the United Methodist institution, for cues about how many hours they should work. A distinctive aspect of the United Methodist Church is its itinerant system, in which bishops and district superintendents assign pastors to churches and change those assignments periodically. In North Carolina, for instance, each year about 25 percent of United Methodist pastors change assignments. Pastors acknowledged that their calling positions them as servants in the United Methodist Church, and they accept itinerancy as their choice. At the same time, though, pastors said the transition between church appointments affects their health in several ways, including disrupting regular sources of medical care, exercise routines and gym memberships. How does your theology inform your health practices? What does it mean to you to embody Christ? 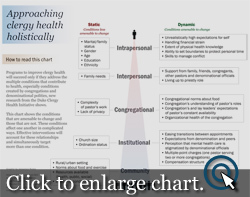 Have particular aspects of your denomination’s polity affected your health? Have institutional factors contributed to your well-being, or undermined it? Who has been particularly supportive of you during your ministry? How might we engage congregations around health issues, from the foods we serve at church functions to the ways we advocate for health in our communities? How could the topic of “clergy health” be broadened into a conversation about laity and clergy roles in the shared ministry of the congregation? They are also forced to re-establish their authority as pastor and work through the toll the changes take on their families. Pastors reported that leaving behind a church and the corresponding friendships is “kind of like grief.” One district superintendent suggested that the lack of a formal grieving process, including the expectation that pastors leave one church and join another within a week, is unhealthy for pastors. Itinerancy exacerbates the financial strains many pastors face. At the lower end of the salary scale -- around $34,000 -- resources such as healthy food and exercise facilities may be unaffordable, especially for pastors raising families. They also may be out of reach during a time of transition, when expenses are high and often another family member has to find a new job. “I had a membership to the Y and then my financial situation became really strained, and I had to cut out some things and that was the thing to go,” one pastor said. Taken together, these findings suggest that health programs tailored to clergy should go beyond encouraging pastors to exercise and eat well. Congregations might support their pastors’ health, for example, by protecting a certain amount of personal time for pastors. Programs can also be developed to improve the functioning of congregations and create procedures to handle conflict so that pastors and congregants alike experience less stress. Health programming for clergy should also integrate physical, mental and spiritual health components. In the United Methodist Church system, district superintendents can support pastors’ health directly through encouraging pastors to take vacations and protect personal time, and indirectly through helping congregations understand pastors’ roles and needs. The amount of time between changing church appointments could also be lengthened. This picture of clergy health counters a popular belief that because clergy are disciplined in their spiritual practices they must also be disciplined in their personal practices. To the contrary, people working closely with clergy have been concerned about clergy physical and mental health practices. This research helps elucidate the pressures and beliefs of clergy, thereby paving the way for clergy, congregations and institutions to work together to create a healthy future for clergy.